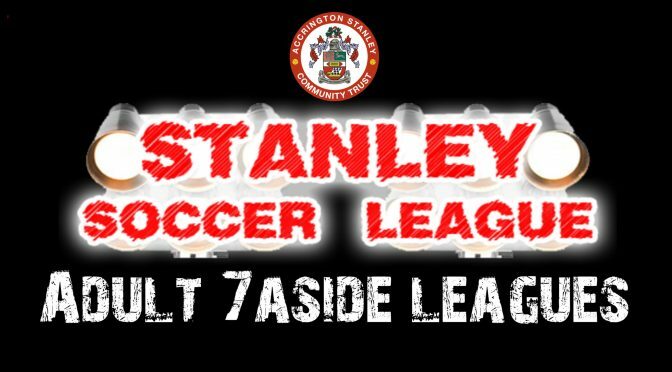 The Stanley Soccer League is a professionally managed small sided league which was set up in Accrington in 2011 by Accrington Stanley Community Trust. The ultimate test for your 7 a-side team is to join one of our leagues. The league is also affiliated to Lancashire FA. 4G Pitch Surface – The matches take place on a state of the art 4th generation pitch as used by some of Europe’s top clubs. Matches – All matches are 40 minutes long, with approximately 5 minutes for a half time break. Kick off times remain the same for each league each season. Each season will last for 10 weeks and consist of every team playing each other twice. The cost of a match is £27 per team. Awards – At the end of each season the Champions of each league will receive a prize. We also secure sponsors who donate additional prizes from time to time. Complaints are taken very seriously here at Stanley Soccer League which has resulted in the expulsion of teams not adhering to the rules and regulations of the league. However, without the feedback of the Referees and teams we are kept in the dark about some key events. If you have witnessed or been a victim of any foul play and/or language and abuse of any kind no matter how large or small then please use the form below to let us know. We will deal with the information in the best way and conduct a thorough investigation. We may need to contact you for further information so please ensure your email address and/or contact numbers are accurate. We often have teams on a waiting list for the league so it will not jeopardize your future matches in any way should players and/or teams be excluded. If you would like to discuss or make a complaint regarding the league set up, opposing teams, referee and management decisions. You must submit an accurate and factual written statement by email to info@stanleysoccerleague.co.uk. Any fixture appeals must be made to Stanley Soccer League Management no later than 48 hours after the fixture. All communication in relation to complaints or grievances will be exclusively between the team manager and Stanley Soccer League. All reports from third parties or other witnesses will be held in strictest confidence. Together lets work together for an enjoyable and trouble free Stanley Soccer League. Issuing of Cautions and ‘Timed Suspensions’: In Small Sided Football yellow cards and associated cautions are not employed. Referees should instead issue a blue card for a cautionable offence. The issuing of a blue card indicates that the recipient will serve an immediate ‘timed suspension’ (‘sin bin’). A blue card offence should always be accompanied by a temporary suspension from play. The period of timed suspension in Small Sided Football shall be two minutes. The release of players from a temporary suspension should be at the direction of the Referee. Recording of Blue Cards: In Small Sided Football cautionable offences that result in a blue card and a timed suspension from the match shall not be recorded and reported by the match official or Stanley Soccer League. Blue card offences should not be reported back to Lancs. F.A. and no disciplinary fine shall be incurred by the player. ‘Serious’ Red Card Offences: Offences not classified in Table 1 below will be the responsibility of Lancs. FA. Once the FA has reviewed the case the Stanley Soccer League along with the player will be informed of the outcome and any disciplinary action. For these offences match officials are required to complete a Disciplinary Report in and submit a copy to Stanley Soccer League and Lancs. FA. ‘Less Serious’ Red Card Offences (as outlined in Table 1): Offences classified within Table 1 will be dealt with by Stanley Soccer League under the delegated-authority of Lancs. FA. The match official should complete a ‘Disciplinary Report’ and ensure that it is sent to Stanley Soccer League. Stanley Soccer League will employ the following disciplinary tariff of suspensions in such cases as outlined in Table 1. There will be no fine for the player. Serious Foul Play 1-4 week suspension depending on severity. Could also lead to a permanent ban. Remit of Disciplinary Action: Any suspensions for offences dealt with by Lancs. FA that is not covered in Table 1 applies to all levels of football (i.e. 11 aside and Small Sided Football). Red cards administered in Small Sided Football for offences within Table 1 are the responsibility of Stanley Soccer League to deal with according to the FA’s recommended tariff of suspensions and are from Small Sided Football only. Stanley Soccer League are not permitted to issue financial penalties to players or teams as a supplement to the disciplinary tariff; only The FA or County FAs are permitted to issue fines for discipline. 1) The small sided team that the individual played for when committing the offence. 2) The team captain of the team that the individual played for. Referees please download Small Sided Football Disciplinary Report below which needs to be filled in for ALL applicable cases. Okay, your leagues sound great! but I hope we’re not going to put everything into winning the league just for a well done and a pat on the back? Certainly not, the overall winners of our leagues can walk off with a prize at the end of the season. I’m not that sure how the standard of my team will compare with the teams in the league, how do I know that I’m going to get a decent game every week and not end up getting thrashed every week, or even us thrashing other teams? We will have a discussion about the ability of your team prior to grading you in the league. We understand that getting spanked or doing the ‘pummelling’ is no fun to anybody! The grade of competition you will be up against will be carefully managed after discussions with the team manager. Our team are not exactly world-beaters. Does that mean that we’ll miss out on the end of season celebration? Of course not, everyone is welcome at the end of season presentations. A great opportunity to do a post-mortem on the season and enjoy a few beers together. As stated, based on venue availability, we do attempt to run a presentation evening on the final night of each particular league season. You have persuaded me. How do I go about joining one of the leagues? Simply fill out the online form on our Enter a Team page by clicking here. How many players can be used in one game? 12 players may be used in any one game, 7 on the pitch at any one time and 5 rolling substitutes. Will there be promotion & relegation? If your League has a number of divisions. Yes, 2 teams are promoted and relegated. However, if a team has won/lost a division by a large margin then Stanley Soccer League reserves the right to regrade the team. What type of footwear can be worn? The required footwear is trainers or moulded football boots. Please note that no studs/blades will be allowed. What happens if our opposition doesn’t turn up? We will look to arrange another team to fill in for your opponents and you will receive a 5-0 win. Your normal match fee will still need to be paid. What if a team drops out of our league? When a team drops out of the league the Stanley Soccer League representative will try to replace them, if this cannot be done a friendly game will be arranged at the same time. Do we require matching shirts? Yes if possible, in the case of a colour clash, bibs will be provided. Are shin pads compulsory? Yes, for players own safety. Do you supply the match ball? No, match balls must be brought by the teams. It is both teams responsibility to ensure there are enough balls available to complete the match and if one is kicked over to retrieve it. Do you supply the referee? Yes, a Lancashire FA referee will be supplied for all games. Is there a membership fee & how much are the games? There is no membership fee and matches are £27 per team. What happens if we don’t turn up to a fixture? If your team doesn’t turn up to a fixture you will be fined your match fee of £27. If you let us know you cannot attend we will try and get a replacement team to stand in for you to avoid a fine being passed on to your team. Please note there are no cancellations on the day of a game.